UPDATED: Thu., July 26, 2018, 3:06 p.m.
WASHINGTON – Hard-hitting Rep. Jim Jordan launched his long-shot bid Thursday to become the next House speaker, saying Congress isn’t doing enough to back President Donald Trump and positioning the right flank for a leadership battle that could define the GOP. 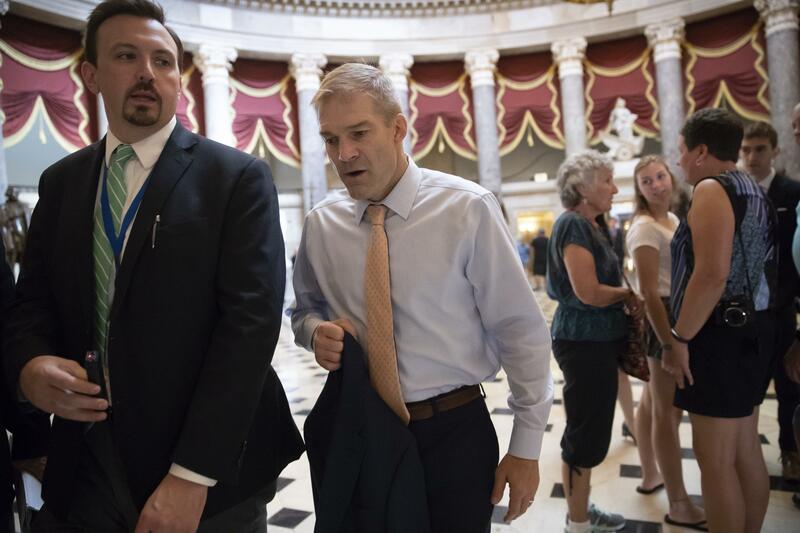 Few House Republicans believe Jordan could amass the votes needed to replace retiring Speaker Paul Ryan – especially amid allegations in the Ohio State University sports doctor probe – even though grassroots conservatives are widely backing his run. But in announcing his bid – less than 24 hours after introducing a resolution to impeach Deputy Attorney General Rod Rosenstein – the combative former wrestler is setting down a marker that the right flank wants a seat at the House GOP’s leadership table. The leadership race puts pressure on Ryan – and rivals for the speaker’s job Majority Leader Kevin McCarthy and GOP Whip Steve Scalise – to more forcefully back Trump and meet conservative demands on a host of issues, including their battle with Rosenstein and the Justice Department. Jordan’s run poses the biggest challenge for McCarthy, the California Republican who is next in line to replace Ryan but has been unable to secure the votes needed for the job from the right flank. It’s the same shortcoming McCarthy faced last time he ran for speaker, in 2015, and provides an opening for Scalise, the Louisianan who is more closely aligned with the GOP’s conservative wing. McCarthy brushed off questions about the race Thursday after having spent the morning meeting with 100 House Republicans for a pep talk before lawmakers left town for a long month of summer campaigning. “I’m spending my time keeping the majority,” McCarthy told reporters. McCarthy has become a top fundraiser as the party struggles against a potential Democratic wave to keep control of the House this fall. Scalise’s office declined to comment. And Ryan reiterated his support for McCarthy as his preferred replacement. But Jordan’s announcement, timed alongside the introduction of the resolution to impeach Rosenstein, allows both questions to stew during the recess, interjecting a new element in the midterm election. Conservatives see Jordan’s bid as leverage in their fight against Rosenstein to produce more classified documents related to Special Counsel Robert Mueller’s probe of Russian interference in the 2016 election. Their resolution to impeach Rosenstein is hanging over the House and could be called up for a vote after they return in September. Fellow Freedom Caucus co-chairman, Rep. Mark Meadows, R-N.C., tweeted that he fully supports Jordan for speaker. “It really is about who is going to make the best case about how they are going to make sure this place operates well in the long run,” Meadows told reporters. Jordan, 54, is a founder of the conservative House Freedom Caucus, and considered its chief strategist. The group has roughly 30 members, making it a key faction among the chamber’s current 236 Republicans. Clouding Jordan’s race, however, is a chapter from his days as a young coach at Ohio State University. The former wrestling champion was interviewed recently by lawyers investigating allegations that a former team doctor sexually abused male athletes decades ago. The six-term congressman has denied claims from some of the wrestlers that he knew of the abuse. Ryan and the other leaders have stood by Jordan during the university probe, and several Freedom Caucus members said they would back him for speaker despite the investigation. Many other GOP lawmakers frequently bristle at Jordan’s caucus, which they consider too inflexible and dogmatic. Ryan is set to retire from Congress when it adjourns in January. An initial round of leadership elections for the new speaker will be held in November, ahead of a floor vote next year. The question though of who will hold the gavel may be for naught if Republicans lose their majority control in the midterm. Democrats need to gain 23 seats in this November’s elections, an outcome that would give their party control of the speaker’s office. Published: July 26, 2018, 12:30 p.m. Updated: July 26, 2018, 3:06 p.m.